I'm sitting here on my parent's couch in Munroe Falls, Ohio, watching my dad and the neighbor across the street get out their red Toro snowblowers and go to work on the 4 inches of snow we received last night. All I can say is that this snow is quite the departure from the purple crocus blooms we had popping up in our yard on Thursday. So why not go back to Florida for a while? Sure sounds good to me. When we arrived at our condo, one of the first things that I noticed was this sign placed just at the beginning of the road. 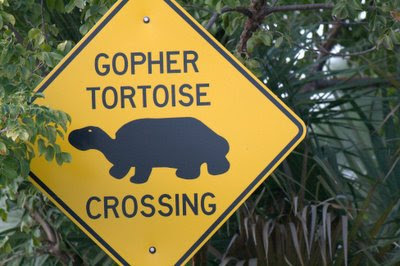 Wow, I thought, how cool would it be to see a gopher tortoises. A true tortoise, I've only seen them in zoos and once back in the mid 90's in a pet store in Akron. This species is decline across its range in the southeast, and in some parts of is range, populations are designated as federally threatened. There was some great scrubby, wooded dune habitat across from our condo that I explored pretty thoroughly, but I never came across any signs of the tortoises. Maybe next time? As I've shown in some of my bird shots, the Ding Darling refuge is a fairly amazing place. There are so many birds there, that an egret walking across the road goes relatively unnoticed. 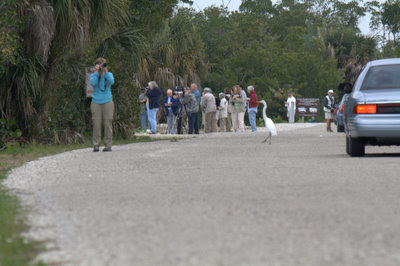 The birders in the background are watching the massive tide pools filled with hundreds of wading birds. 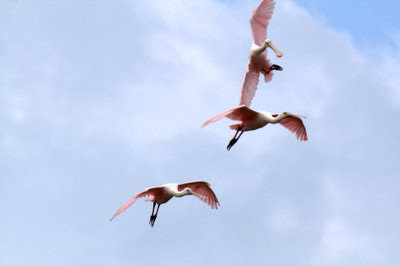 Even roseate spoonbills whiffle every once in a while. Check out the top right bird. 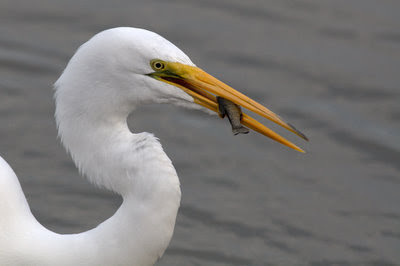 The egrets were quite adept at catching fish. They were plucking them out of the water every thirty seconds or so. 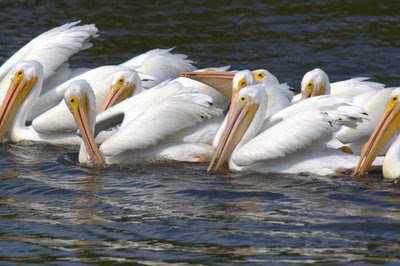 The American white pelicans were really fascinating. 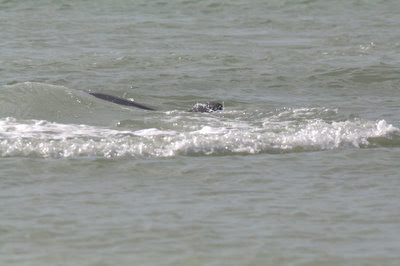 They catch fish as a group, swimming in a close formation and dipping there pouches into the water, sweeping up fish. The plants of the island were also quite fascinating. 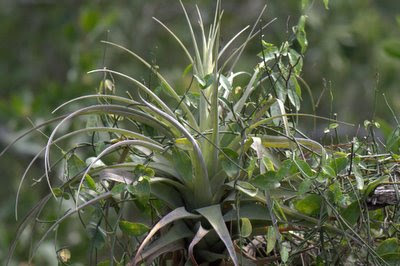 There were air plants like this, probably members of the bromeliad family, clinging to most trees on the island. You really could call Sanibel the island of the osprey. You really can't go anywhere without seeing this creature flying somewhere. 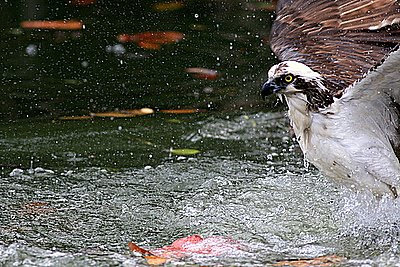 Inland, along the shore, at the fishing pier, and in the canal behind our condo, were all places that I was able to photograph ospreys. 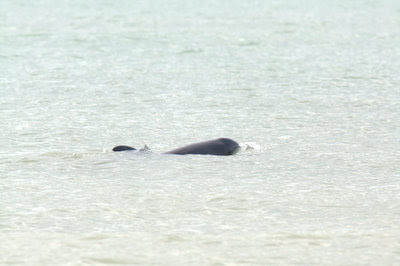 This individual is rising up out of the water after being completely submerged. He dove down from a tree above the canal for a fish, but came up empty after getting really wet. White ibises were also fairly common on the island, and these two showed up in the red mangroves in the canal behind our condo. 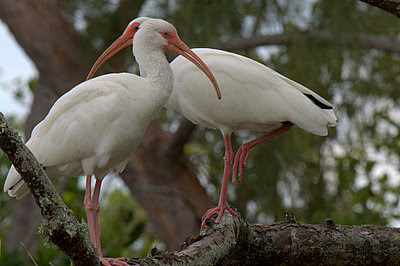 Ibises are the closest relatives of the roseate spoonbill. I love their pink bills, feet, and long legs. And their blue eyes also really pop. At rest, you'd never know that the white ibis has black wingtips. When flying they really stand out. Here's one where I need your help. Does anyone have any idea what these ducks are? I'm guessing that they are an exotic release, but you never know. The male had a bright pink bill and a red eye. Back to the beach. 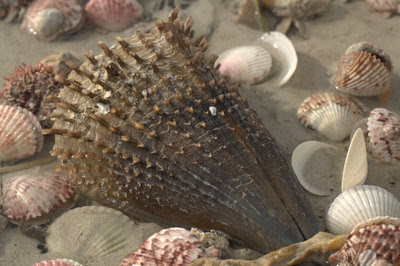 An Atlantic pen shell, surrounded by scallops and cockles. The sea grape, Coccoloba uvifera, is a very common shrub and small tree of the beach dunes in Florida. 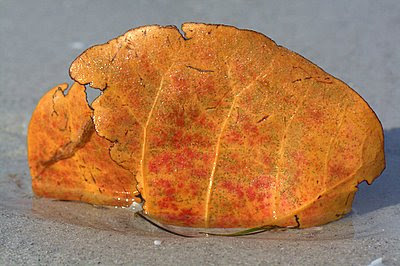 Its fresh leaves are a greenish red color, but the green has faded to bronze in this leaf that was washed up along the gulf shore, embedded in the sand. Coccoloba can be roughly translated as "red leaf". A pretty good name, don't you think? This plant is actually related to our native smartweeds, as both are in the Polygonaceae. 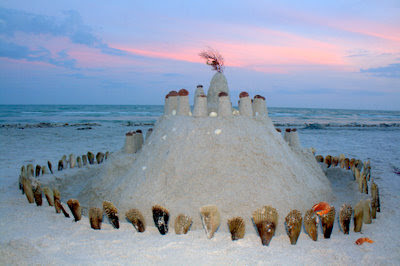 None of the sea-side condos on Sanibel are much taller than four stories, giving the island a natural appearance. 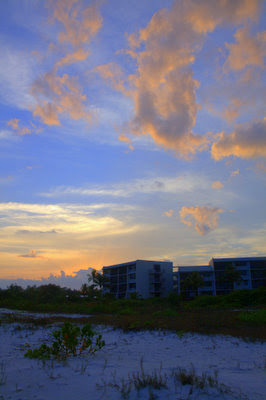 It is great to see beach dune communities between the open sand and the condos. Loggerhead sea turtles nest regularly on the beaches of Sanibel. Sand castle construction is a favorite past time of beach goers here. The abundance of shells and other washed up sea creatures provide extra building material. The red bits in the lower right of this image are crab claws. There were not tons of leps around, but here is an old tattered butterfly I was able to photograph on the beach in the morning. This picture is one for bugguide.net It resembles a monarch, but something just isn't quite right about it for a monarch. Those white spots are throwing me on this one. 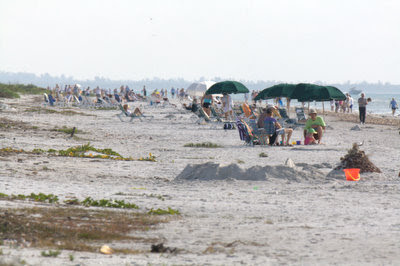 Don't think there isn't the typical beach-going crowd at Sanibel. 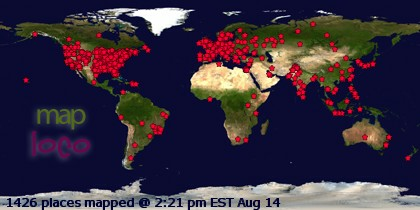 There certainly are plenty of vacationers on the island. 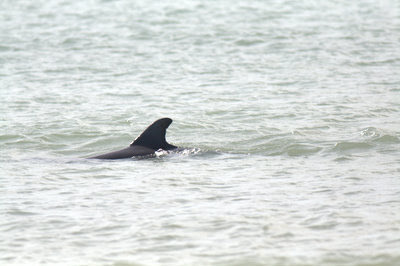 Sanibel offers several opportunities to see large mammals. 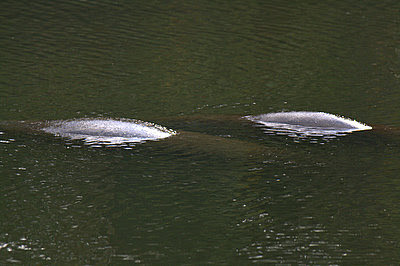 I wish i would have gotten a picture of these creature's snouts-that would have helped to put an ID on them. 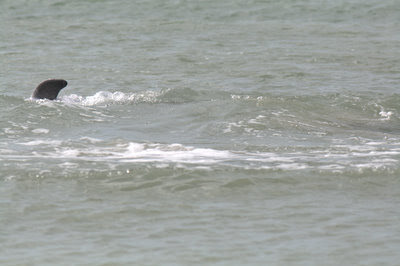 Still, these animals were really having fun, cruising along the beach, and occasionally bursting through the surf as if they were playing. It really looked like they were having a ball. 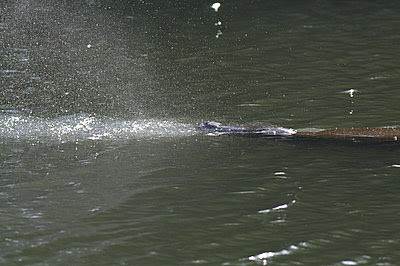 Ahh, and the other large mammal that we watched every day during our trip was the Manatee. What a wonderful, slow, and gentle looking creature. 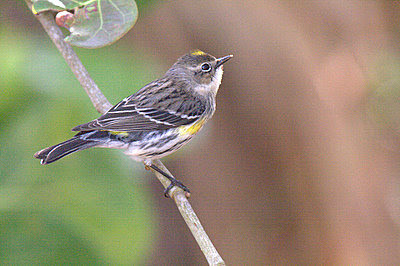 Finally, a few neotropical warblers were hanging out in the sea grapes just behind the beach one morning. 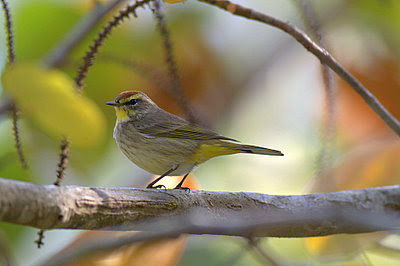 Above, a palm warbler, and below, a yellow-rumped warbler. It won't be too much longer before these birds show up here in Ohio and throughout northern North America. I can't wait- this latest snow is just getting to me. Enjoy digging out! That butterfly is a queen. 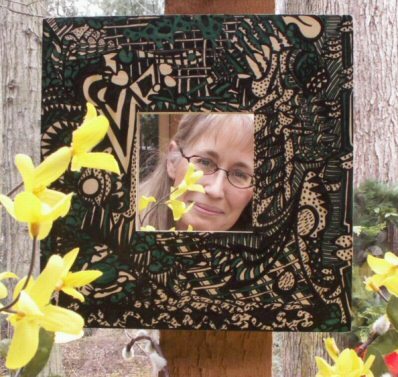 Yes, that epiphyte was a bromeliad. As for the ducks... Caribbean Gardens (Naples, FL) once had a fantastic collection of ducks from around the world, incl a bunch of species of pochards from South America. I do not know what your unkn ducks are, but I'd suggest starting with the pochards if it isn't a NA duck. Sad about gopher tortoises. Free ranging dogs pack up, you know, and chase foxes and other fun toys down into tortoise holes, then try to dig them out. That ruins the burrow for the turtle, which then has to dig a new burrow or clean out an old burrow, thus wasting precious energy. Down with free ranging dogs! Up with leash laws! Open season on unleashed dogs and cats! The armadillo also ruins tortoise burrows. Wonderful Florida pictures..glad you shared them! How much I love seeing your amazing photos from your Florida trip! makes me wish to pack my bags and head south! Bravo job with all these! Cindy- Thank you very much! Quite a beautiful little butterfly. Same genus as the Monarch. That makes sense. It looks like these guys make it to Ohio as well, but I'm guessing they are not common. Thanks again. Hmm, Pochard, I'll have to look them up. Thanks for the tip. And a horrible story about the gopher tortoises. They just are getting hammered it sounds like. They may not be with us all that much longer in the wild, which would be an absolute shame. And armadillos- we only saw them dead on along the road. Are they native to Florida? Mary- Thank you very much. Thanks Tom- These pictures were fun to take. When I first got back, it was hard to look at them, since they reminded me of being ridiculously sick, but as I'm getting better, they are starting to grow on me and I'll have several more sets of images coming up in the next week or so. Drowsey Monkey- Thank you very much. 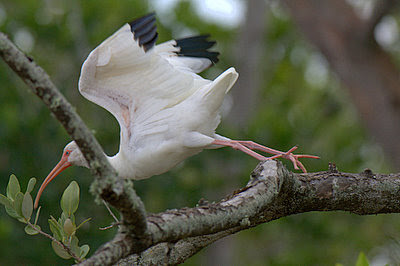 That Ibis image was just complete luck. I'm still amazed that I got all the important parts of the bird unobstructed by the mangrove tree! I enjoyed all of your Florida photos, it reminded me of my trip there 4 years ago. I really enjoyed the video too, I visited the same spot at Ding Darling where you took it but when I was there the birds weren't so abundant. I'm glad you posted it. Tom beautiful collection of photos, love the birds with flat beaks, lol. Anna :) and Happy Easter. I think you have set a record for the number of excellent photos posted as one post. Amazing collection. I really enjoyed them all and hung on to the last words. John- And I'm glad Megan took it! I really should invest in a dedicate video camera. I really lucked out, I believe at "The Ding". Chris- Thank you very much! Anna- Happy Easter to you as well, the roseate spoonbills are really fascinating creatures. Abe- Your kind words are greatly appreciated. Thanks everyone, I hope everyone had a fulfilling and joyous Easter. Oh boy, did I need this break from winter! What a fantastic post this is!! We enjoyed our visit to Ding Darling, but I think you saw a lot more birds than we did. Stunning pictures!! Thanks for the Florida cyber-trip. You've got some great shots there. Thank you. I overheard several people at "The Ding" say that they had never seen it so birdy during my visit! I guess i was just really lucky. These pictures are just incredible. Yes, Sanibel Island is heaven on earth in the winter. It is a porchard - a rosybill to be exact. The hen is a mallard or mallard x ?? hybrid. Beautiful pix as always, Tom! OK... This collection was easier... The Snowy Egret is easily my favorite in this group! Cathy- It really was. I couldn't have asked for a better place to have Influenza and fever for four days! Thing- You rock. I should've known that you would have gotten this one! Rob M. just sent me a whole pile of work from Ann Arbor and he put it in a very nice DU tote. Great stuff. 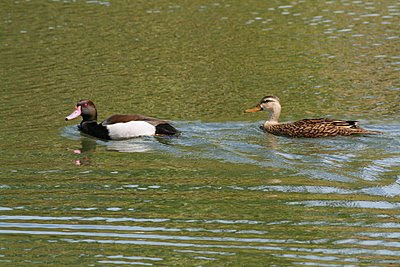 Also, if the female with the pochard is not a female pochard, I'm guessing that it may have been a Florida mottled duck? Not sure why she would be hanging around this guy though? 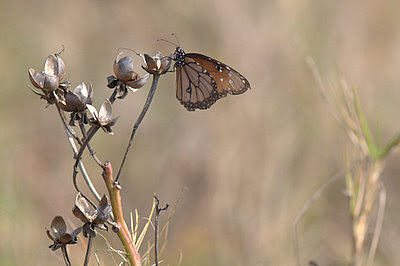 Your Butterfly ID is a Queen I found them in the Everglades this past January Great post thanks for sharing!